Thanks for visiting my site. I am Santhosh Kumar Sharma Gollapelli. Astrologer and Developer of this website. Please go through my profile to know more about me. I was born in a traditional Brahmin family in the Dharmapuri village (Jagityal District, Telangana) as a fifth child. My father late Sri Anjaiah, was a teacher and my mother Smt. 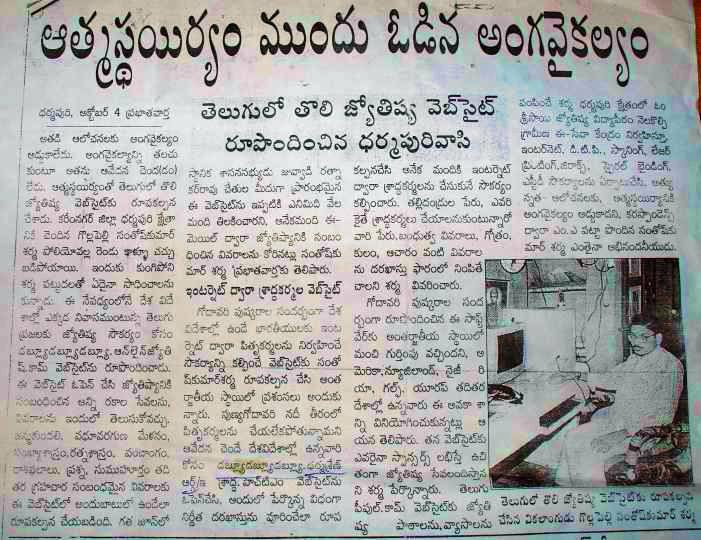 Venkata Lakshmi is a home maker. As a hobby she serves people with her Ayurveda Medicines, since she has good knowledge in it. We are five brothers and two sisters. 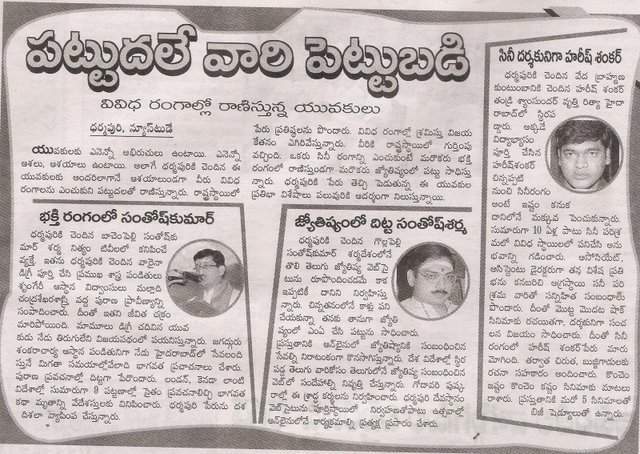 I have completed my Post Graduation in Telugu Literature from Osmania University in 1997. 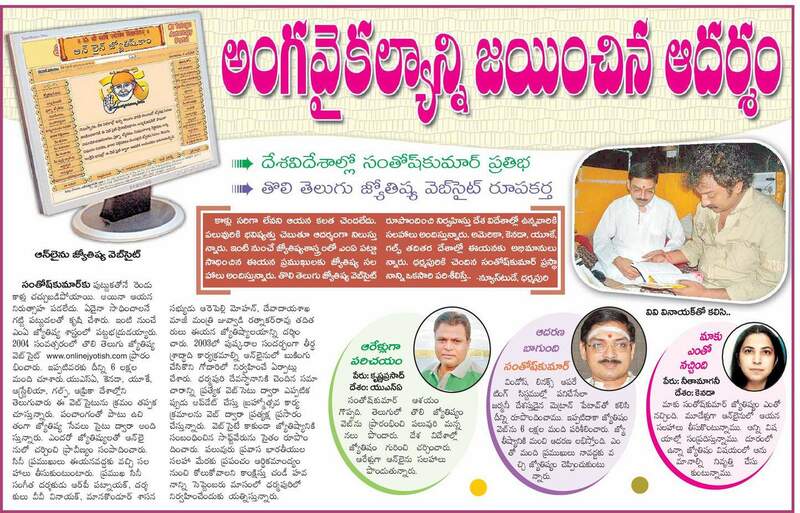 All my education from my childhood to acquiring a degree dealt with languages like Telugu, Sanskrit and its literature. After my Post Graduation I started learning astrology. It was in the year 1996 October, on the day of Vijaya dashami (Dasara) (a very big festival for all the Hindus) Day I was sitting nearby a Temple and all of a sudden I got a thought "How about learning Astrology???". Till that time, I had no knowledge in astrology at all. But as a traditional family, we used to see some astrological debates between my uncles. Immediately after getting the thought of learning astrology I went to my uncle's (Late. Sri Gollapelli Pedda Hanmandlu, a well-known traditional astrologer from Dhamapuri) house and asked him to teach me Astrology. He kindly accepted my request. It is a Swayam Siddha Muhurta day, when I started learning Astrology. It's been a tough challenge for me as I don't know even the basic things like number and names of Nakshtras and rashis. In the mean time I completed my P.G. Exams and continued learning astrology. I wanted to do a Ph.D. In Telugu but, the Almighty's wish was different and I obeyed it. By birth I am a Juvenile Rheumatoid Arthritis patient. With the effect of the disease suddenly I lost sensation of my both legs while I was going to write an entrance exam for Ph.D. This incident has changed my whole life. I had to take bed rest for a year. After recovering a little bit, I again started learning Astrology. I studied traditional astrology for 3 years. As my uncle was a traditional astrologer, he did not teach the other systems of astrology. By studying the books of Sri Sivala Subrahmanyam and other writers I came to know that K.P. Astrology is more accurate than other systems in astrology. So I studied K.P. System too. I also referred Lalkitab and some other systems in Vedic Astrology. With the knowledge I gained from my gurus and books I practiced it day and night for more than 3 years. Then only I started giving Astrology services to people. In the year 2002 my cousin (Late Shri Velpuri Srinivas) encouraged me to start free Astrology services online to people through our Temple website http://srilakshminarasimha.org (Formerly dharmapurishrine.org). Within a short period, I got tremendous response from all over the world. 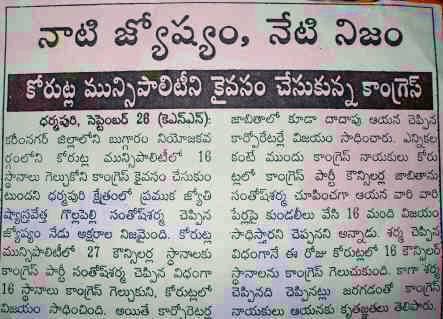 Most of them are Telugu people from various countries. They asked me to start a complete website for various astrology services in Telugu as there is no Telugu Astrology website before my website. 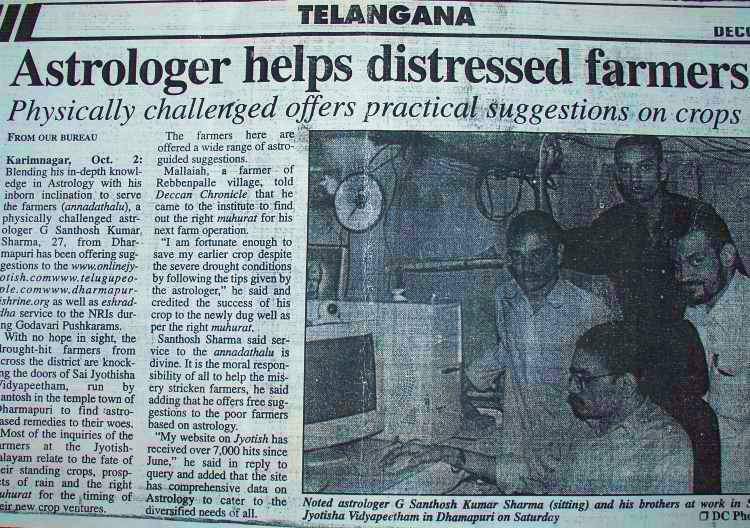 With the help of my cousin Late Mr. V.Srinivas, I started this web site in April 2004. From last 12 years, through onlinejyotish.com I am giving astrology services. We are offering various paid and free astrology services through this website. Janmakundali for complete chart analysis, forecast reports for analysing a particular issue, Consultancy Service for instant analysis and discuss about your birth chart and problems, Horary Astrology to get answers for various types of problems and situations, Birth time rectification for unknown birth time, Muhurta service for selecting good time for various Auspicious events, Kundali Matching for selecting right life partner with the help of Vedic Astrology, and in free services you can find lot of services like daily panchanga, Rashiphal (Rashifal), know your birth sign, monthly predictions and many more. We are also performing various Vedic Remedies, Pujas, Yagya for the help of needy people. don't forget to leave your feedback. Om Sri Sai Jyotisha Vidyapeetham as an organization was established on the same day, when I registered for this site. The main idea of this organization is to spread Vedic Knowledge and the greatness of Astrology through some rituals, lectures and Yagyas. My aim/ambition is to start a School of Vedic Sciences at Dharmapuri to strengthen the Vedic Culture. Blessings of the God and the people are the real Awards and honours for me. I got an honorary title "Jyotisha Ratna" on the occasion of Akhila Bharatiya Jyotisha Sameelan held on 28 October 2004, on the celebrations of Asheeti Janmadina Mahotsavam of Jyotisha GuruJi Sri P.V.K. Punneswara Rao in Hyderabad. Here I am giving some News covered about me and my predictions in various newspapers and television channels.